Capt. Ron Johnson: 'I Am Sorry' For Brown's Death : The Two-Way The Missouri Highway Patrol officer in charge of security in violence-wracked Ferguson says: "You are my friends and I am you." Missouri State Highway Patrol Capt. Ron Johnson speaks during a rally at Greater Grace Church on Sunday. Capt. 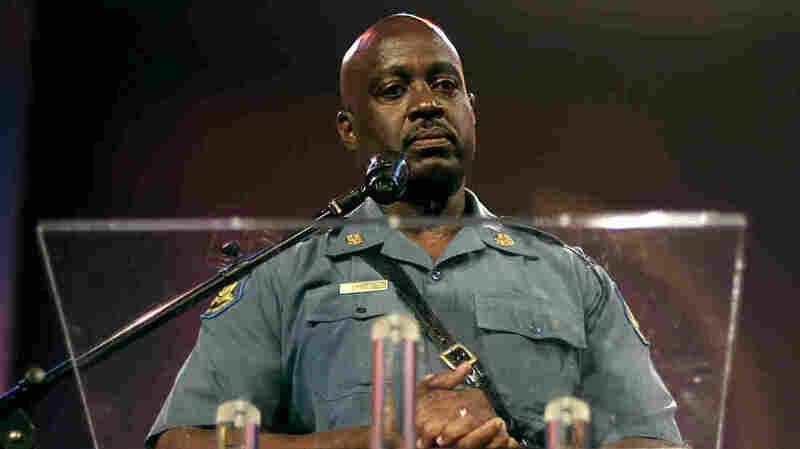 Ron Johnson, the Missouri Highway Patrol officer in charge of security in Ferguson, Mo., told a thousand-strong audience gathered in a local church that he has a "heavy heart" over the violence and anger in the city in the wake of the police shooting of unarmed black teen Michael Brown. Johnson, who is black, was handed security in the volatile St. Louis suburb by Gov. Jay Nixon last week, after local authorities were accused of a heavy-handed approach. Speaking at Greater Grace Church, where more than a thousand people gathered to remember Brown, Johnson said meeting the boy's family "brought tears to my eyes. "To the family of Michael Brown, I want you to know that my heart goes out to you and that I am sorry," he said to thundering applause. "I wear this uniform, so I'm standing up here to say I'm sorry. "This is my neighborhood. You are my family. You are my friends and I am you," Johnson said, appearing to tear up. "When this is over, I am going to go in my son's room. My black son," Johnson told the cheering crowd. "Who wears his pants sagging. Wears his hat cocked to the side. Got tattoos on his arms. But that's my baby."